Continuing from yesterday’s post about the cancelled hearing, I’d better once again state I was the person who made the information request. Here however is a brief chronology of what has happened so far. 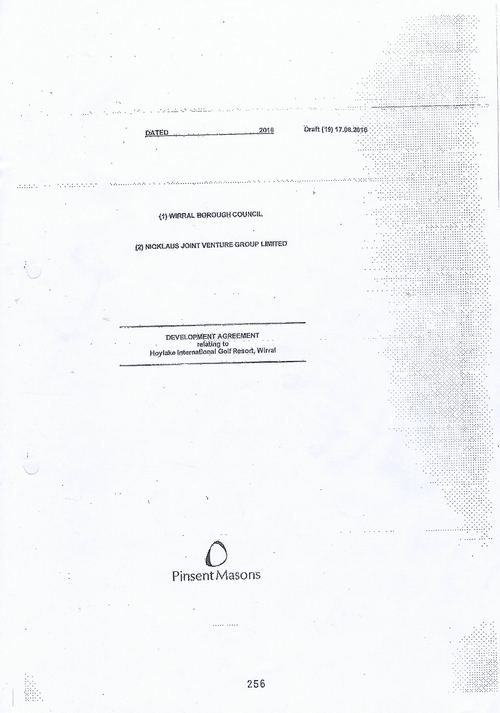 12th December 2016 – EIR request made to Wirral Metropolitan Borough Council by myself for 122 pages of information. 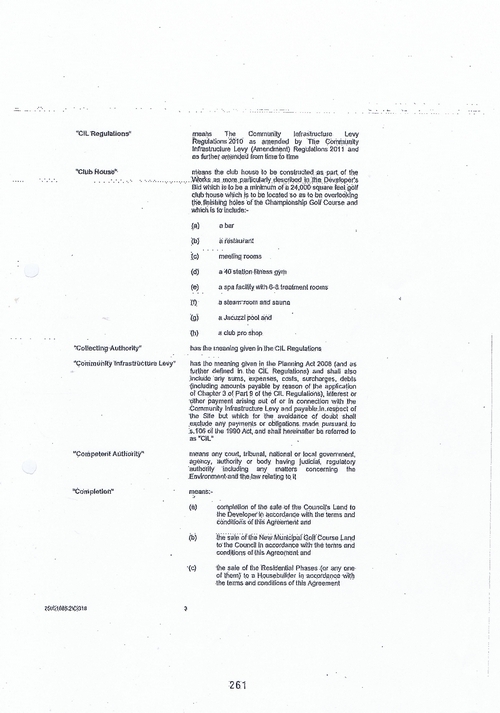 10th January 2017 – Wirral Metropolitan Borough Council refuse request giving Regulation 12(5)(b) and 12(5)(e) as reasons. 2nd Feburary 2017 – Reconsideration of Wirral Council’s decision of the 10th January 2017 requested by myself. 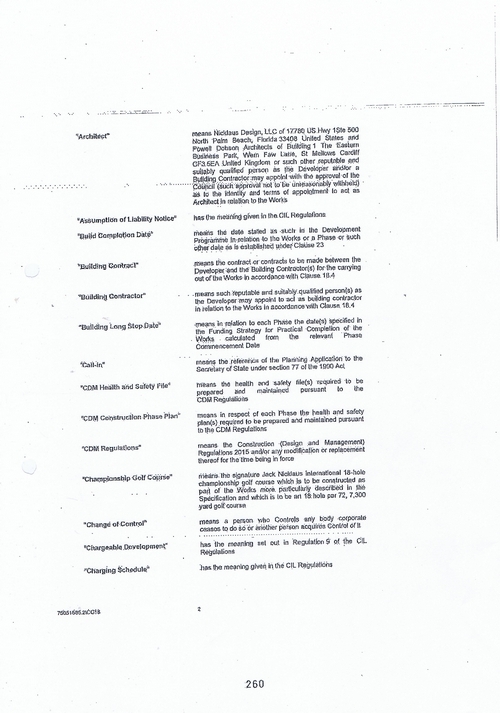 3rd March 2017 – Wirral Metropolitan Borough Council refuse request giving Regulation 12(5)(b) as applying to pages 15-42 and Regulation 12(5)(e) as applying to pages 43-136. 15th March 2017 – I appeal this decision to the regulator ICO (Information Commissioner’s Office). 31st August 2017 – Wirral Council appeal ICO decision notice FER0672223 to the First-Tier Tribunal (Information Rights) which becomes case EA/2017/0191. 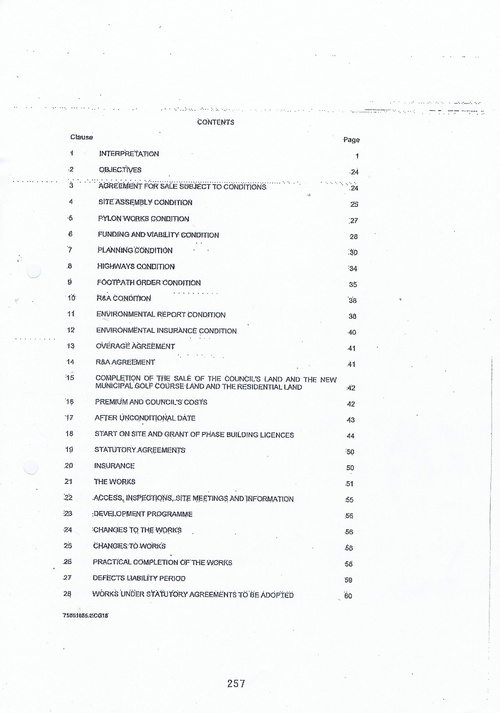 14th September 2017 – Wirral Council change their mind about the application of Regulation 12(5)(e) and disclose some of the information. 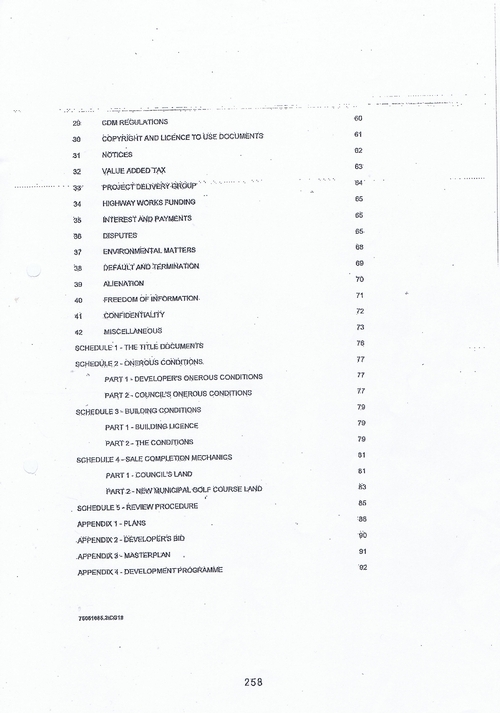 74 sections are still redacted. 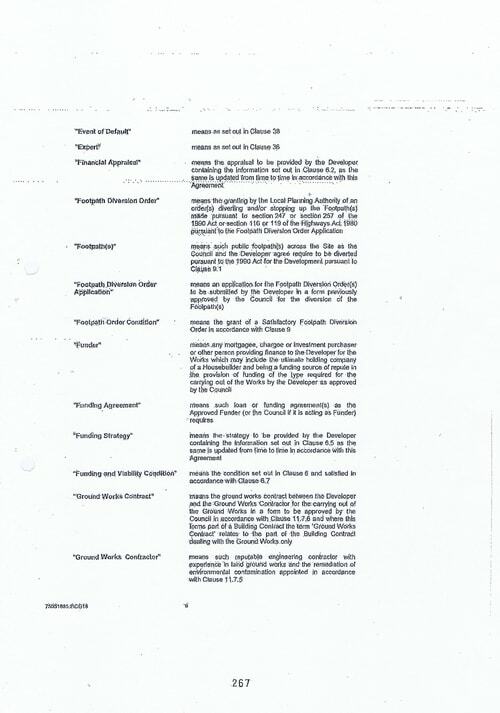 18th September 2017 – Wirral Council disclose a further A4 page accidentally left out of the disclosure on the 14th September 2017. 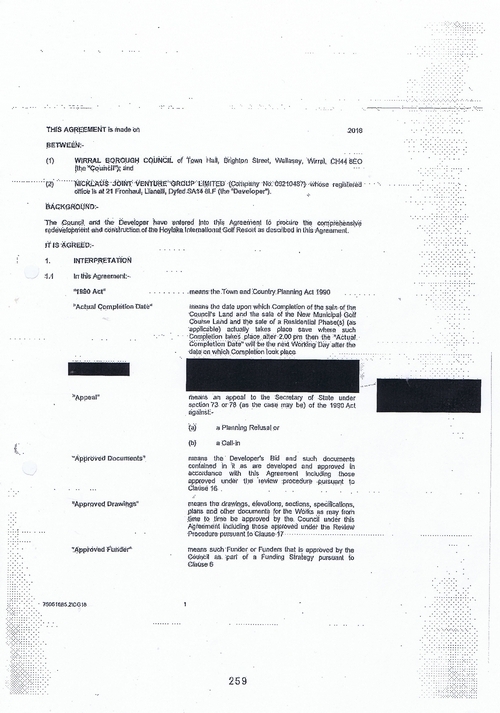 9th February 2018 – Wirral Council disclose further sections by post to the person requesting the information. 12th February 2018 – First-tier Tribunal (Information Rights) cancels two-day hearing listed for 13th and 14th February. 14th February 2018 – 15 minute telephone conference between parties and the First-tier Tribunal (Information Rights). So below is a combination of what the first 28 pages of what was disclosed to me on the 14th September 2017, 18th September 2017 and 9th February 2018. 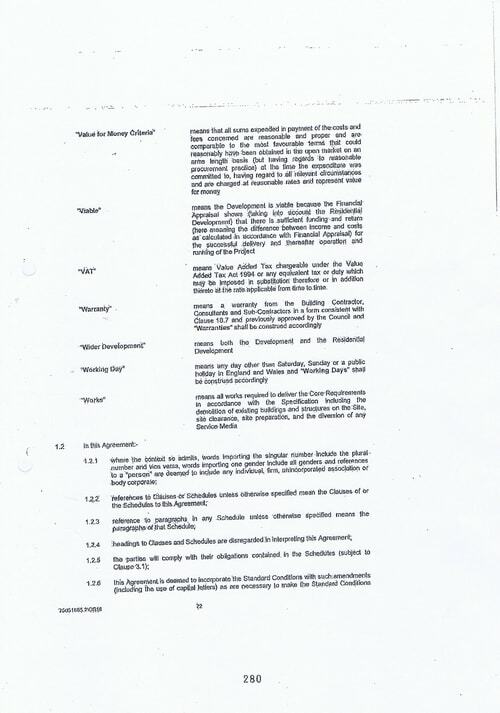 By way of background it is the contract between Wirral Metropolitan Borough Council and the developer Nicklaus Joint Venture Group Limited. 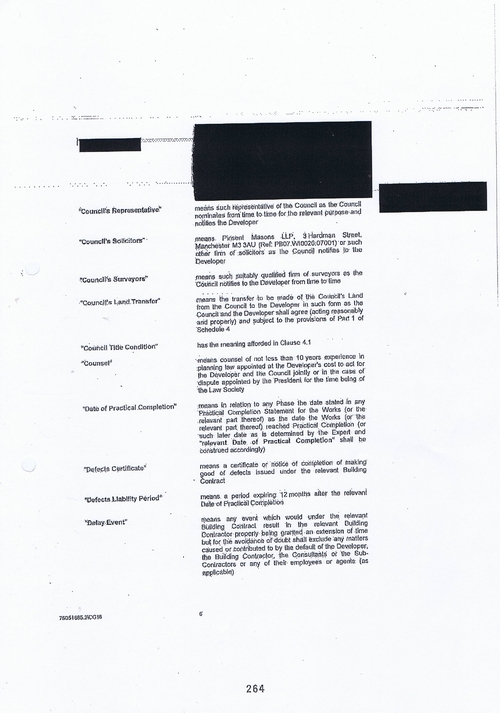 Unfortunately as Wirral Council has resized the text multiple times to make it smaller than it originally was (presumably in part so it doesn’t appear over a hole punch in a hearing bundle), then printed it at a very low resolution, some parts are now extremely unreadable. Below each image of each page below I have tried as best I can to provide a copy of the text. 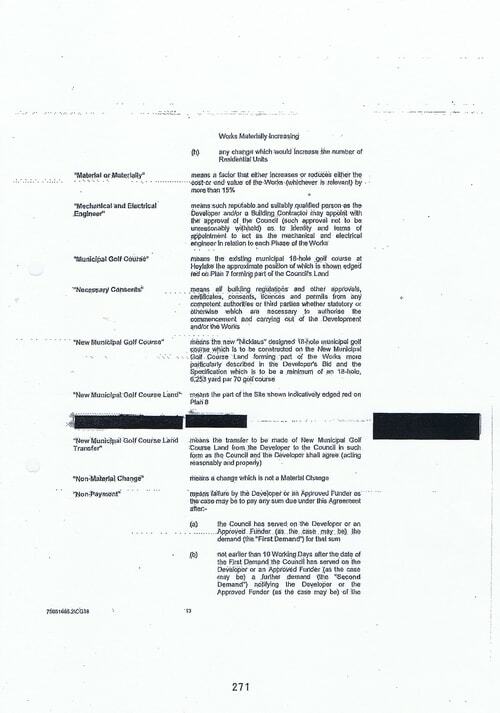 The parts of the text that were revealed to me on Friday 9th February 2018 have got a grey background. 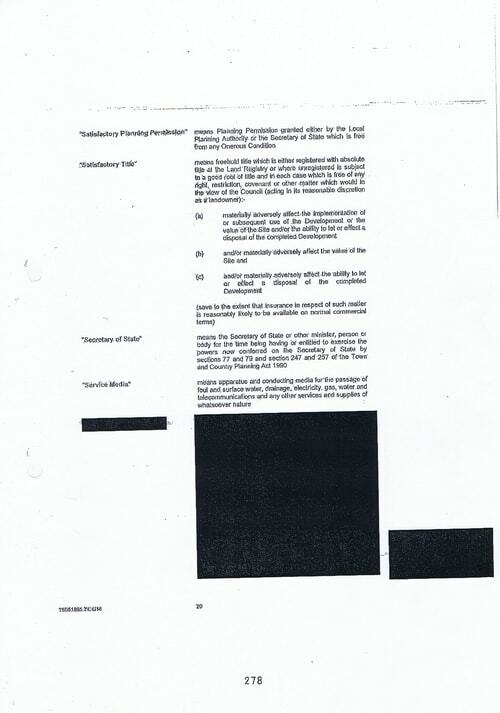 The blacked out annotations in the right margins of each page weren’t on the original, refer to the reason or reasons why redacted parts were redacted. 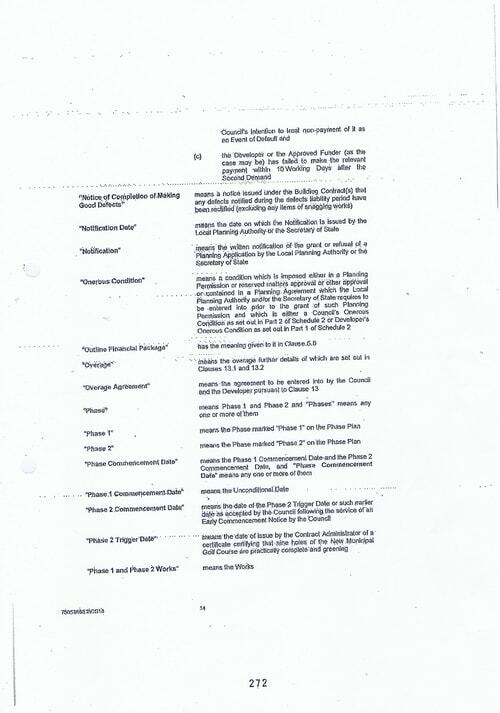 For the reasons check this document and for page 19 this document. 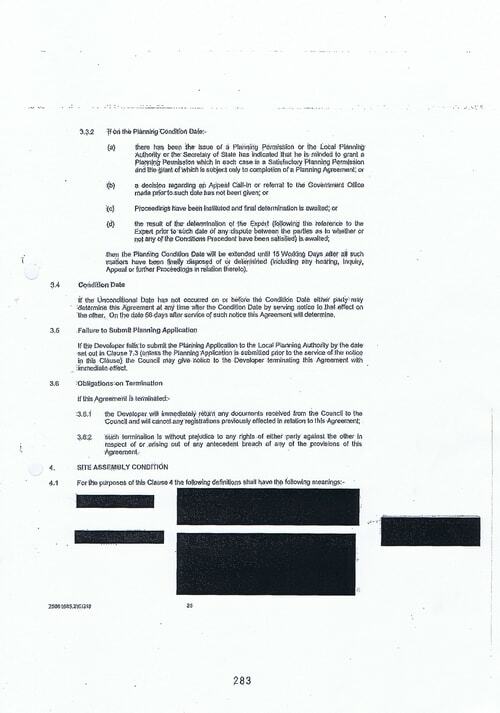 What has been supplied has also had its original page numbers removed and confidentiality markings too. Page numbers have been added to the footer (pages 256 – 283) as these are the page numbers in the hearing bundle. There are a further 67 pages after these that form part of the contract that I haven’t got around to publishing in an easy read format yet. This is partly because some of the text has to be manually typed (using a magnifying glass on the text) due to a combination of artifacts and low resolution. However you can download a zipped file of all pages here (bear in mind this is a large file and may take some time to download). If it’s of use to you, please leave a comment. Pages below may make more sense once read with the rest of the contract. (2) NICKLAUS JOINT VENTURE GROUP LIMITED (Company No. 09210487) whose registered office is at 21 Fronhaul, Llanelli, Dyfed SA14 8LF (the “Developer”). 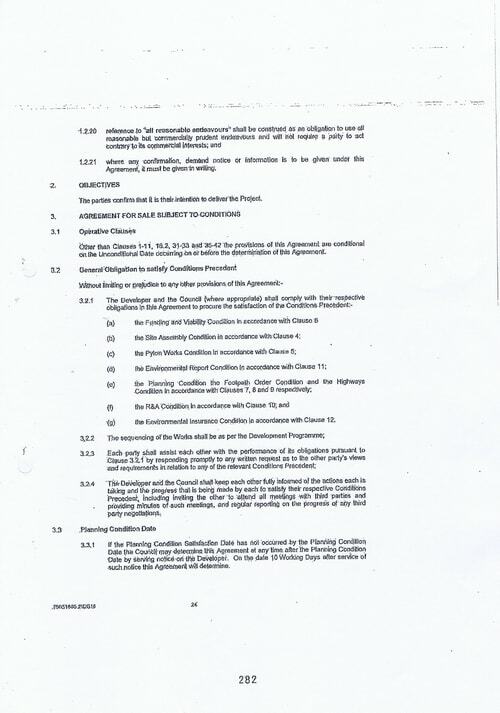 The Council and the Developer have entered into this Agreement to procure the comprehensive redevelopment and construction of the Hoylake International Golf Resort as described in this Agreement. 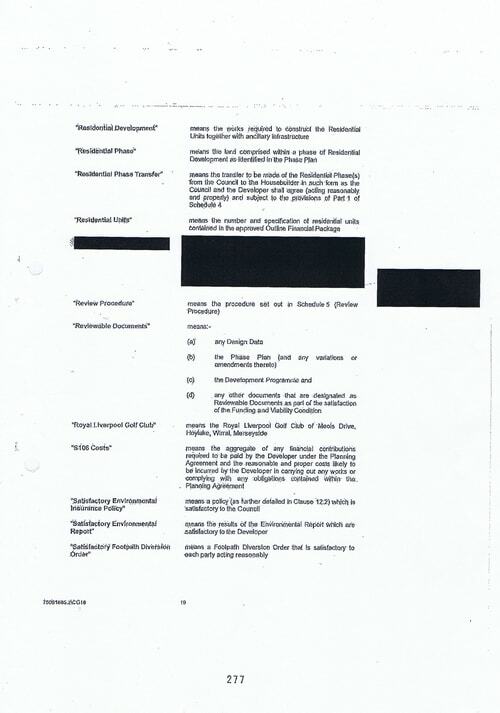 “Environmental Works” means any works identified by the Environmental Report and/or identiﬁed during the carrying out of the works which are necessary to enable the Development to be constructed, having particular regard (but not limited) to the presence of the former landfill site as identiﬁed in the Capita Symonds Technical Assessment Hoylake Golf Resort Project dated August 2007 and /or any other landfill site or Hazardous Substances revealed by the Environmental Report and/or during the cariying out of the works. 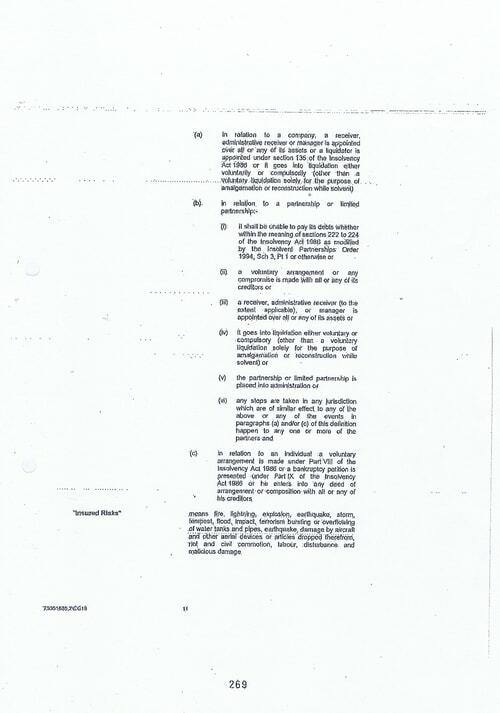 1.2.21 where any conﬁrmation, demand notice or information is to be given under this Agreement, it must be given in writing. The parties conﬁrm that it is their intention to deliver the Project. 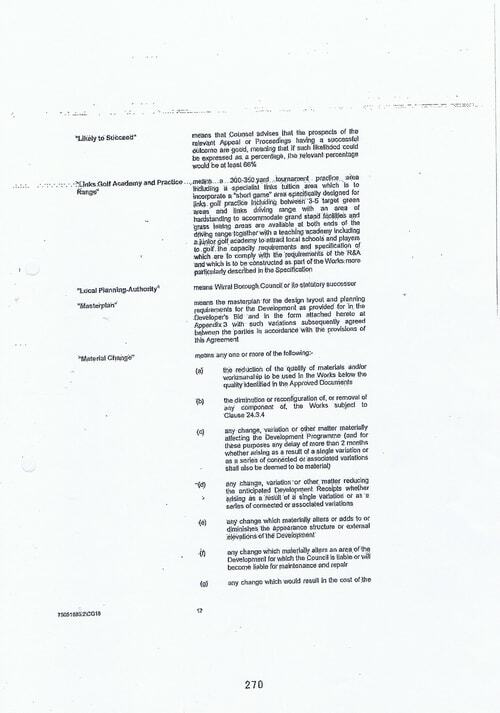 Other than Clauses 1-11, 16.2, 31-33 and 35-42 the provisions of this Agreement are conditional on the Unconditional Date occurring on or before the determination of this Agreement. (g) the Environmental Insurance Condition in accordance with Clause 12. 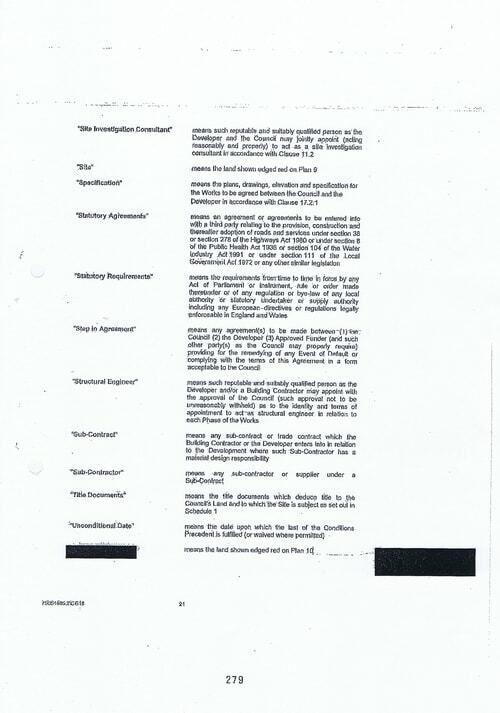 3.2.4 The Developer and the Council shall keep each other fully informed of the actions each is taking and the progress that is being made by each to satisfy their respective Conditions Precedent, including inviting the other to attend all meetings with third parties and providing minutes of such meetings, and regular reporting on the progress of any third party negotiations. 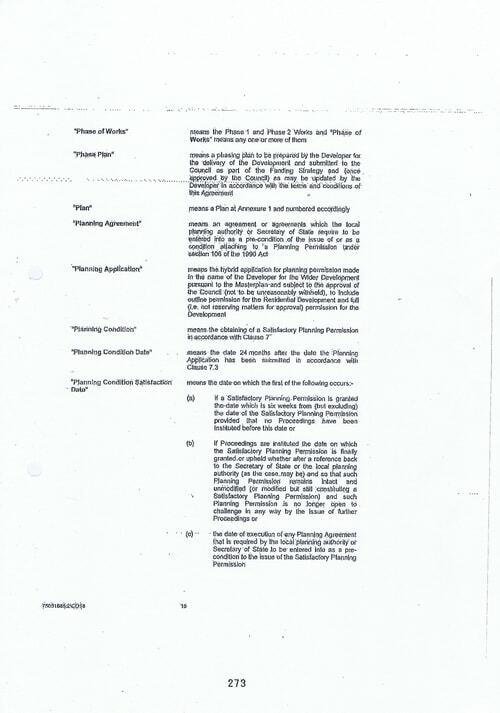 3.3.1 If the Planning Condition Satisfaction Date has not occurred by the Planning Condition Date the Council may determine this Agreement at any time after the Planning Condition Date by serving notice on the Developer. 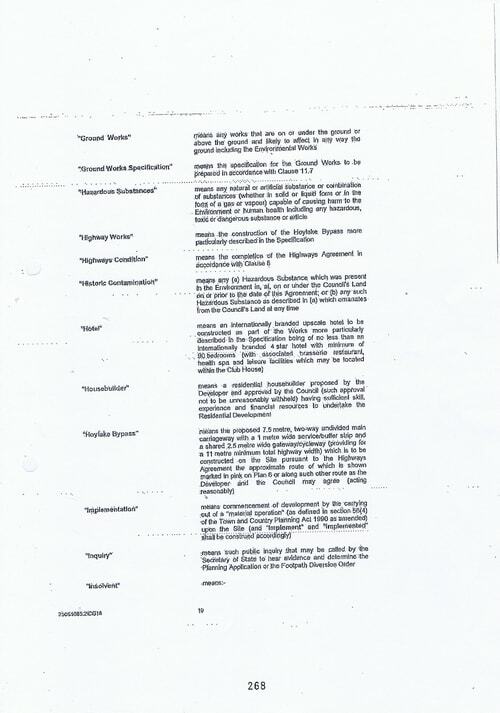 On the date 10 Working Days after service of such notice this Agreement will determine. then the Planning Condition Date will be extended until 15 Working Days after all such matters have been finally disposed of or determined (including any hearing, inquiry, Appeal or further Proceedings in relation thereto). If the Unconditional Date has not occurred on or before the Condition Date either party may determine this Agreement at any time after the Condition Date by sending notice to that effect on the other. On the date 56 days after service of such notice this Agreement will determine. 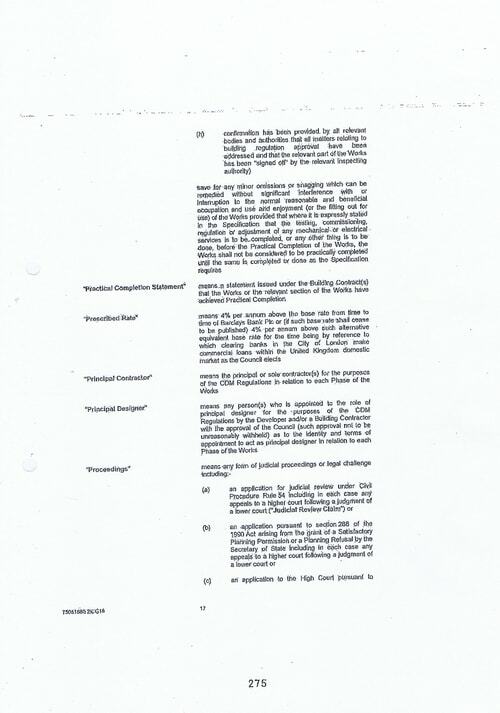 3.6.2 such termination is without prejudice to any rights of either party against the other in respect of or arising out of any antecedent breach of any of the provisions of this Agreement. Does anyone know of any free OCR software that can deal with image files, multi-page PDF files and can cope with artifacts and low resolution? FreeOCR really struggled with some of the images because of the low image quality. I’m on a PC at the moment. Hi John, I know the print is small but I could bot see anywhere the phrase due diligence has been performed on a tin pot company with 5 directors with a 1000 £1 shares which is not paid up with no money in the bank and a £190million budget. Wirral council have lavished £600k so far so can you enlighten me as to who the investors might be. I assume this document contained in a very large brown envelope?? ?.Also Million pound road scheme who will be paying for that, and as far as jobs are concerned most would low paid, and what would green fees be? also what financial benefit would there be for ratepayers?. Serious question which I hope you know the answers too then. 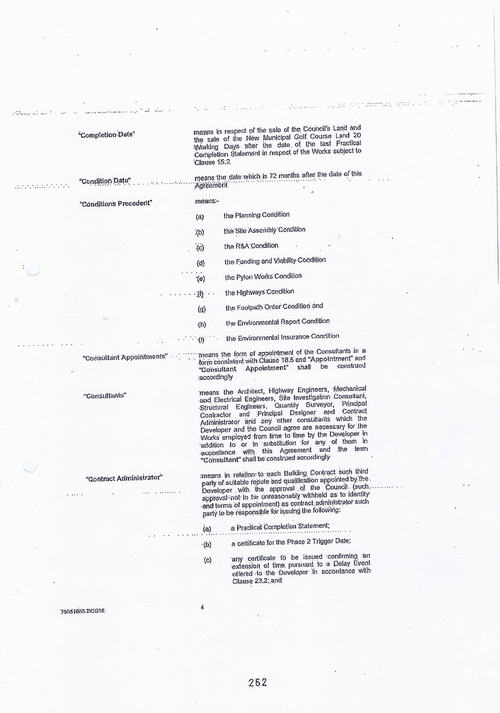 The issue about the road scheme is addressed in the contract. Just out of interest the highway works are estimated at costing around £16.5 million. It’s on page 65 in section 34. 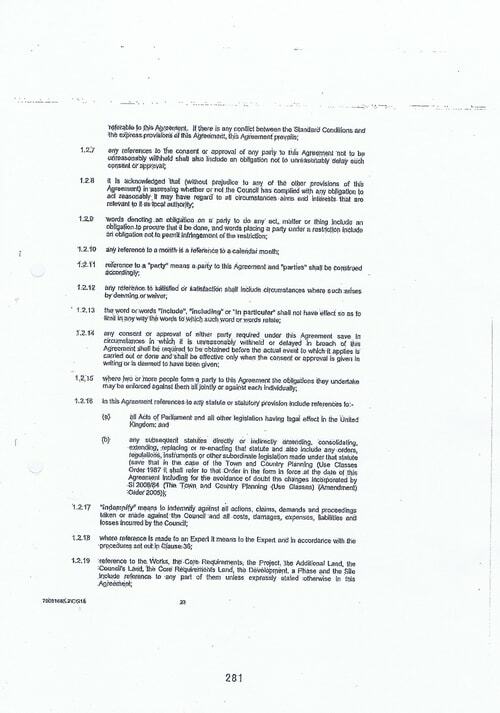 34.1 Prior to entering into this Agreement, the Council has applied for central government funding in respect of the Highway Works. 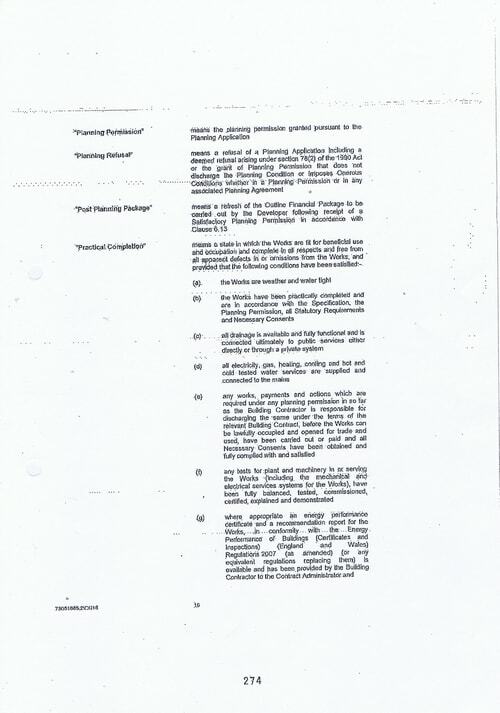 If the Council’s application is successful, it will apply the funding that it receives towards the Highway Works and/or (at its discretion) carry out the Highway Works (subject to any terms and conditions attaching to that funding). 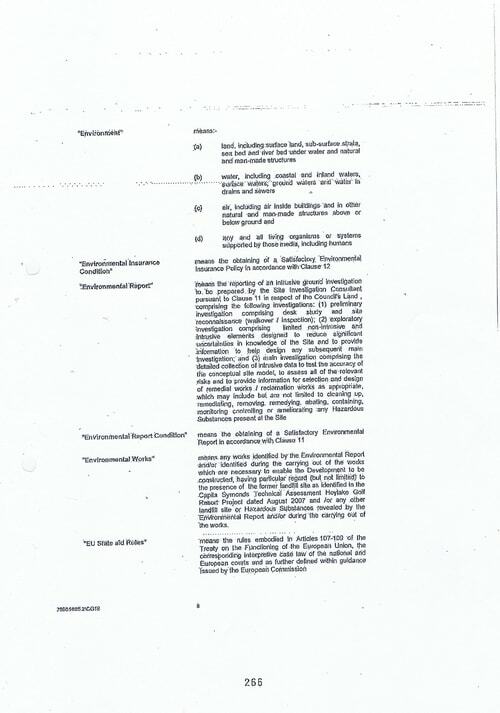 34.2 If the Council receives no, or insufficient central government funding for the Highway Works, then subject to receiving the Council’s Premium from the Developer, it will apply such amount of that premium as it reasonably required to fund the Highway Works. So to sum up, Wirral Council will ask the government. If the government say no, Wirral Council will pay for it using the money they get from the Developer! In other words, they won’t spend their own money on it as far as I can tell, just other peoples’ money! 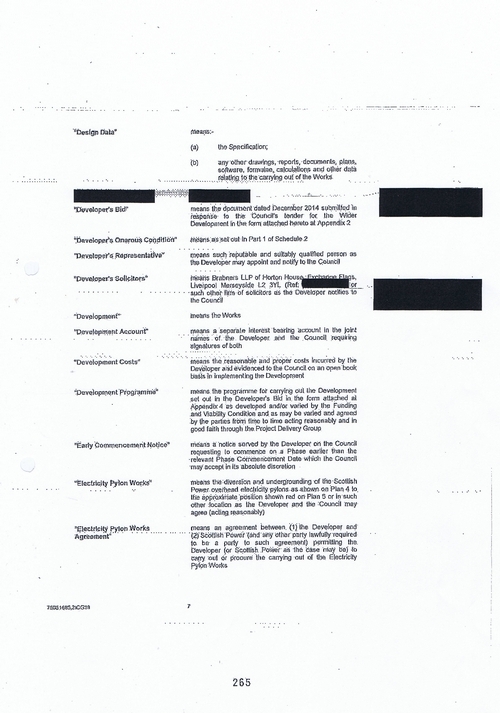 Wirral Council regards the time that the 5 NJVG Ltd directors have spent on the project as an “investment”. 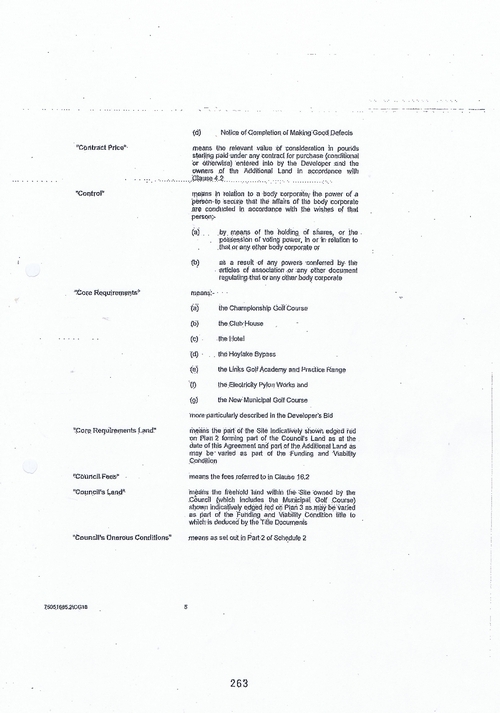 c) business rates receipts from the business element of the project. However I would state however that Wirral Council will also have to provide services to these new dwellings (such as collecting rubbish etc) which could be more than the extra Wirral Council receives in council tax, business rates etc. I hate this Golf course, the are going ahead with it, because they think they are getting roads and house’s with it, but i still want to know if the Council lends the £24 million to this Developer is it legal, i read in the papers the other day about Barclays bank doing the same thing, and that wasn’t! The loan from Wirral Council to the Developer is up to £26 million (which is a little higher than the £24 million you mentioned). 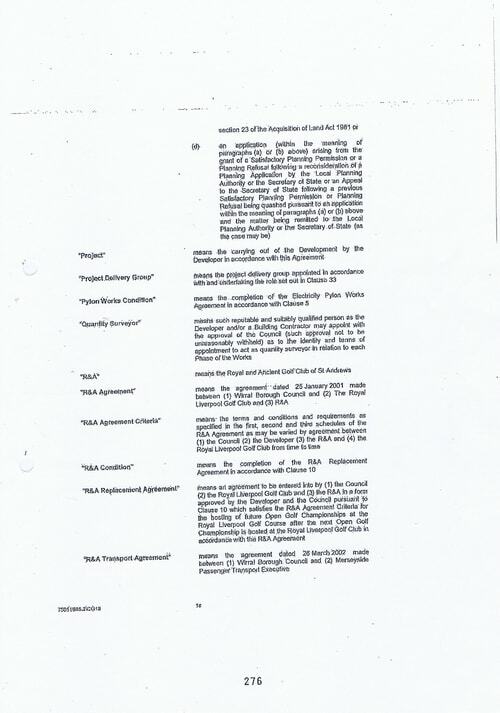 However the Development Agreement published as part of this post goes into more detail about it. However the loan won’t be given until planning permission is granted. As the developer hasn’t yet applied for planning permission (a decision on the planning application is expected in June 2019), it’ll be a while before the Developer receives any money in the form of a loan from Wirral Council. However the decision to do so was made at the special Cabinet meeting on the 18th December 2017.